Line from the film: "Excuse me, could you pass the syrup please? Please?" Finding the right roommate can be difficult. 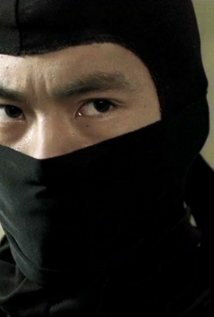 In fact, as we see in director Steven K. Tsuchida’s 2003 short film A Ninja Pays Half My Rent, sometimes it can be murder. When his original roommate David (Anthony Liebetrau) dies in a freak grapefruit accident, Barry (Timm Sharp) advertises for a new one, and to his surprise, an honest-to-goodness Ninja (Shin Kyamada) agrees to move in with him. As you might expect, adapting to life with a trained assassin has its share of problems, but after working out some of their issues, Barry and his new roomie quickly become the best of frien… well, they reach an understanding. Unfortunately, the pairing wasn’t destined to last, and one day, after returning home from his morning jog, Barry realizes just how dangerous the life of a ninja can be. To be honest, A Ninja Pays Half My Rent wasn’t the movie I set out to review today, but after coming across it accidentally (I found this short while checking out some trailers on a random DVD), I knew I had to switch things up. Director Tsuchida, who co-wrote the script with Aaron Ginsburg and Wade McIntyre, squeezes some big laughs into this very short film (one scene in particular, where Barry tries to “train” his new roommate at the breakfast table, is laugh-out-loud funny), and even finds time to throw a surprise ending into the mix. Hilarious and fun, A Ninja Pays Half My Rent definitely brightened my day. Where can you get this from?